On the latest episode of Called to Coach, we hosted Gallup-Certified Strengths Coach Austin Suellentrop. Austin is Vice President of Organizational and Leadership Development at Regions Bank. Austin manages the associate engagement efforts at Regions Bank, which is where he was first introduced to strengths in an effort to help foster an engaging work atmosphere. In order to become fully immersed in strengths, Austin and a few team members attended Gallup’s Accelerated Strengths Coaching course, which he describes as a life-changing experience. Getting everyone in an organization -- especially those in leadership positions -- to buy into strengths-based development isn’t always easy. At Regions Bank, Austin says the strengths-based approach spread primarily by word of mouth. But now it’s something they don’t even have to actively advertise to their internal partners; it has taken on a life of its own, impacting the organization at all levels -- including leadership. When introducing individuals to strengths, Austin says it’s important to begin with only their top five strengths. Learning your strengths can sometimes be overwhelming, and Austin adds that when revealing the full 34 themes, people tend to gravitate toward the bottom themes instead of focusing on their strongest talents. To hear more about Austin and how he uses strengths to empower individuals, leaders and teams, watch the full video above. Austin joined Regions Bank in 2008 as a member of the Management Associate Program. 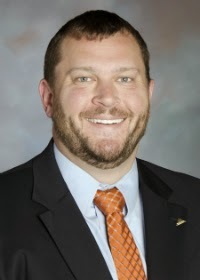 After completing the program, he spent four years in the branch network serving in a variety of roles in north central Alabama, most recently as branch manager. Austin and his wife, Janna, serve as the Directors of Youth Ministry at Our Lady of the Valley Catholic Church where they work with high school youth to apply their talents inside their communities and families.